Bodog Poker was launched in 2004 and is considered one of the oldest and biggest US-friendly poker rooms online . Bodog is also renowned for its sportsbook and online casino products which provides a decent serving of new and inexperienced players into the Bodog Poker room. Known for its outstanding promotions and bonuses, as well as a wide selection of games and plenty of regular tournaments, Bodog is the perfect online destination if you are looking for soft competition with loads of customization available on the tables. In our Bodog Poker review, we take an in-depth look at the pros and cons that shape this US-friendly online poker room, present the current bonuses and promotions on offer when you register a new account, walk you through the most popular tournaments and freerolls, evaluate the software and graphics, and assess the selection of games that you can except to find while browsing through the poker lobby. We also provide the most popular banking options that you can use to transact on your Bodog Poker account and give you valuable insight into the Bodog customer service. Bodog Poker welcomes newly registered customers with a sensational 100% match bonus up to a maximum of $1,000. Unlike other online poker rooms that only accept your initial deposit towards the welcome bonus, Bodog Poker will include all your deposits made within 24 hours after account registration. The welcome bonus is released in increments based on the accumulation of Poker Points on both cash games and tournaments. You will have a total of 30 days to accumulate 10,000 Poker Points to receive the maximum bonus amount of $1,000. Also, look out for Bovada bonus codes. Apart from the 100% welcome bonus, players can also look forward to a Royal Flush bonus that can occur on any Texas Hold'em real money cash game and will pay 50 times the big blind amount up to a maximum of $200. In addition, Bodog Poker also offers a Bad Beat bonus that will pay 100 times the big blind amount up to a maximum of $1,000 when you have a Full House containing aces full of kings or better and you lose against a Four of a Kind of better. Bodog Poker offers an impressive range of weekly tournaments as well as a handful of annual tournaments that provide enormous prize pools. The Mini Poker Series and Bodog Poker Open each provide lucrative prize pools for players looking for rewarding multi-table tournaments. If you are more interested in Sit & Go's, you will find Bodog Poker also offers an excellent variety to cater to your needs. The most popular tournaments currently available at Bodog Poker include the $100k guaranteed tournament on Sundays for a buy-in of $162 and the $250k guaranteed tournament for a buy-in of $325. You will also find loads of qualifiers and satellites for popular tournaments, allowing you to hit the felt and enjoy some well-deserved poker action on the tables. Apart from multi-table tournaments, Bodog is also home to an assortment of freerolls and sit & go's, regardless of your pocket size. The tournament lobby is updated daily, ensuring new tournament are available around the clock. Bodog Poker utilises a slick and modern user-interface with glossy graphics that are easy on the eyes and even easier to understand. poker tournament players players are introduced to a variety of customization tools, ranging from background graphics to table themes. You will also find an All-In percentage tool indicating the probability of you winning the pot if you go all-in which is a rather helpful and unique tool. The best feature at Bodog Poker is the use of anonymous tables. This eliminates other players instantly recognizing you when you sit down and enhances the overall player experience. Other unique features include hand history viewer, single session player notes, and instant heads-up rematches. You can play on a total of 4 tables simultaneously which features an innovative picture in picture view. 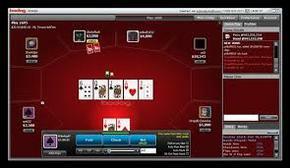 Bodog Poker provides an excellent range of cash games to suit all bankrolls. 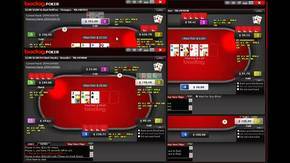 The site also features a fast-fold poker variant known as Zone Poker. This allows you to immediately jump to a new table once you fold, eliminating the waiting process completely. Zone Poker is considered 4 times faster when compared to a regular cash game. Players can enjoy No-Limit Texas Hold'em, Fixed-Limit Texas Hold'em, 7 Card Stud, 7 Card Stud Hi-Lo, Omaha Hi-Lo, Pot-Limit Texas Hold'em, Caribbean Stud, and 5 Card Draw. The most popular tables include 6 handed games while weekend will feature 9 handed games, especially when playing Omaha. Bodog offers a great range of payment methods for both deposits and withdrawals. The best banking option is Bitcoin, but there are several other popular payment methods available too, including a variety of e-wallets, bank transfers, credit/debit card options, money transfers, and more. Most of the deposit options can also be used to make a withdrawal, including regular check that takes up to 2 weeks to receive your winnings by post. Bodog is also renowned for processing withdrawals in record time, taking less than 48 hours on e-wallet payments and up to 3 days for credit/debit card payments. Should you ever have a query or an urgent request, you are more than welcome to contact the friendly and professional support staff at Bodog Poker. You can reach them by either requesting a live chat, giving them a quick call, or by sending an email where you will usually receive a response within 24 hours. In addition, you can also make use of their comprehensive FAQ section that is filled with helpful articles to improve your overall game and guides on how to register, fund your account, and convert your poker points to cash in both the casino and sportsbook products.